Assistant coach Devon Crawford stands alongside Coach John Hastings and the rest of the varsity baseball team as he soaks senior captain Connor Klug. Klug pitched a one hitter in the Saturday, May 17 game against Homer in the Al Glick Diamond Classic. 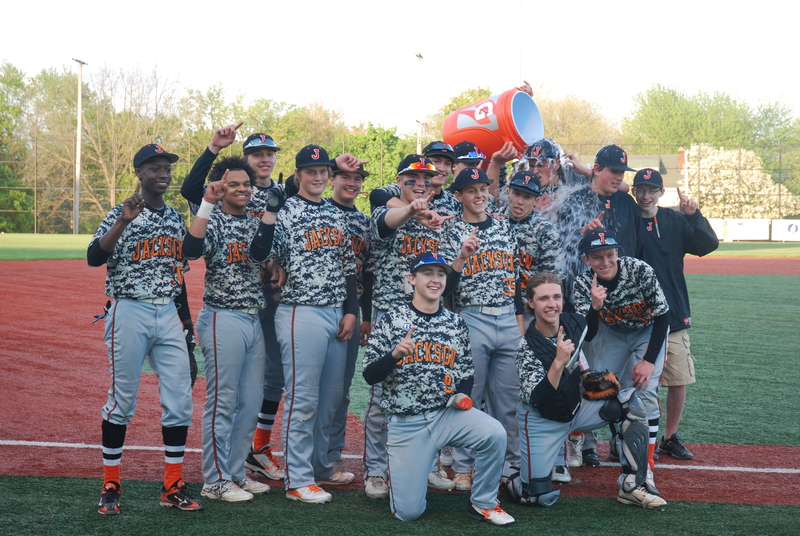 The Jackson High Dirtbags allowed no runs from either Homer or Lumen Christi in the past weekened and won the tournament. Homer, with a previous 26 game winning streak, were defeated for the first time in the champoinship game on Saturday by the Viking Dirtbags. For senior Kane Broadus, a passion for art started at a young age. At only twelve years old, his love of art transformed into a fascination with tattoos. Today, tattoos have centered themselves in Broadus’ life. Interestingly enough, Broadus has given himself multiple tattoos. He explains it as a great way to practice and new tattoos are readily available if his desire for a new one arises, rather than the normal, lengthy process it would take to go and get one. However, there is a downside to creating permanent skin art on oneself as it is “way harder to do than it would be on others,” Broadus said. One of his masterpieces, an intricate knife, is located on the front of his lower leg. He proudly shows it off and explains the difficulty of the task. “I had to just sit there, bent in an unnatural and strenuous position, for hours on end,” Broadus said. Art teacher Linda Jacobs has had Broadus in a class or two over his high school years, beginning 2D art being one of them. She admires his tattoos and notes that his designs were great, joking about not wanting one for herself though. “In art, he is absolutely excellent. That’s his thing and he is very serious about it,” Jacobs said. Broadus describes his tattooing style as Traditional Flash. He has depicted various designs, but has not yet delved into realistic portraits due to the fact that it would require more experience, or skill, as well as better equipment. Other than art and tattooing, Broadus participated in track. He competed in the pole vaulting events for a season. Broadus also enjoys long boarding, but uses it mainly as means of transportation. Broadus sets his goals high for his life after high school. “I am determined to be a successful person,” Broadus said. He is planning on continuing his art career. Wanting to attend school in Marquette for business, Broadus also anticipates being an apprentice in a tattoo shop in order to further develop his skills. Many people know her as one of the starting basketball players on the girls’ varsity team, but there is more to senior Chelsy Hall than what meets the eye. She has an artistic side that many do not know about. When Hall is not playing basketball she hand makes rugs. Hall has been making these rugs since last year and has made a total of five rugs for family and friends. Art has become an important part of Hall’s life over the years. “I get to create new and cool things,” Hall said. Hall first started making rugs for an independent study class for art teacher Linda Jacob’s last year. “I liked making the rugs and have been doing it ever since,” Hall said. Hall makes her rugs on a loom in Jacob’s room. Hall cuts her color of choice fabric into strips and places the fabric on the loom which begins the process. Each rug takes three weeks to make. Hall’s main interest in art is doing things she can do with her hands and anything that is 3-D. Hall has been in Jacob’s class for all four years of high school. Over the years Hall has taken on bigger and more advanced art projects. Halls years of high school are slowly coming to an end. Hall is going to miss seeing everybody and a lot of the teachers. Hall is not sure which college she wants to attend yet, but is looking into playing basketball somewhere. Hall wants to pursue a degree in physical therapy. She also wants to continue taking art classes throughout college. “I’m open minded,” Hall said. Students who walk the hallways of Jackson High School may pass by the one and only Tim Steele. They probably don’t know the remarkable person which he is. They’ve probably never heard about his 33 ACT score. Nor have they heard about Steele applying to two big- name schools, Stanford University and Brown University. Evidently, there are many remarkable aspects of Tim Steele that the average person may not know. While all can agree that Steele is knowledgeable, perhaps even greater of his traits is his wisdom. Steele is one of the small percentage of people who are wise enough to come to school every day prepared to work hard and to be themselves. “Jackson High is easy to blend in to,” said Steele. “People respect you for who you are. Steele is also wise for the fact that he gets involved in Jackson High School. Being captain of the Jackson High Quizbowl team is one of Steele’s favorite occupations. The undisputable leader of the team, Steele is the reader of the questions in Quizbowl (that is how the team practices). “Steele is very outgoing, and he’s not afraid to make mistakes,” French teacher and Quizbowl instructor Pamela Nordhougen said. “He likes to share his knowledge, which makes him a good role model for the rest of the Quizbowl team. Steele is a remarkable student, and he has plans to go far. Steele’s 33 score on his first ACT will most certainly help him get there. Still waiting for word back from Stanford University as well as the Ivy- League Brown University, Steele hopes to become a computer engineer with the degree that he earned at his school of choice. Overall, Steele is a very interesting person who is actively involved in school. He has definitely set the bar high for himself in terms of plans, but if anyone can do it, it is Timothy Steele. Senior Caitlyn Spencer has been very involved, whether it is in school or out in her community. She is a strong spirited person, very honest and does not keep things to herself. She pushes herself to be the best she can be. She is a kind hearted person that puts others before herself. She is an inspired young adult that puts a lot into her church. “Take delight in the lord, and he will give you the desires of your heart. This just lays on me to remember that whatever I want to do, I have to do it for God or it won’t work out, because I can’t do it without him,” Spencer said. She puts a lot into her church and helps out in many ways. She is a part of the worship team, youth group, and the stewardship committee. In the youth group, she inspires a lot of the children that she teaches lessons to. “I love to spend time with the younger kids and just talk to them and encourage them,” Spencer said. She coordinates fundraisers to raise money for mission trips, helps plan community events and service projects. Band has been a large part of her life; she has been in band for seven years. “I love how band challenges me, it pushes me to do more,” Spencer said. She plays the alto saxophone in the marching band, jazz band, and concert. “When she plays she is so committed, she practices all she can,” senior Maya Rowland said. Not only does she play alto saxophone for the school band but she also plays the piano for the worship team in her church. Caitlyn was inducted into National Honor Society at the beginning of her junior year. She is the social services chairperson. Each month she plans a service project which is then carried out by the members of the NHS. Like any other teenager, in her spare time she likes to hang out with her friends. Instead of just sitting there doing nothing she likes to get creative. Her and her friends go on Pinterest and find fun things they can make. After high school, Caitlyn has everything planned out; she wants to major in mathematics for education. She also wants to major in English and plans to write a novel someday. Jackson High has one of the best student athletes in the area. From his greatness on the football field to his friendship in the halls, Haught is a proud Viking. He was once a Western Panther but when he decided on a high school he chose Jackson High. Elvis was a three year varsity player and because of his size and talent he could contribute early. “Elvis is fun to be around, he always finds the positives if something’s going wrong or someone’s having a bad day,” senior Rourke Carroll said. He will be taking his experience to Olivet College to continue his football career as a lineman and study criminal justice. His future plans are to become a police officer. Of course some of Haught’s favorite experiences are in football; “My favorite moment is beating Holt my last season at Jackson High,” Haught said. When Haught was younger, his parents got divorced. Since then his dad has not been part of his life. Haught’s experience at home with his mom has not been easy. Recently, Haught has moved in with a friend. He moved because he needed a more stable environment to live and study. “He is always positive and no matter what happens he’ll find the best way through it,” Carroll said. Knowing that he might not have dinner or be able to rely on his mom was not what he wanted. Although Haught moved out he still visits several times a week to check up on his brothers and sisters and make sure everything is ok.
Haught had a lot of help getting through the process of moving out and getting by on his own. “Coach Dillon has helped me with the process and gives me jobs during the summer for money,” Haught said; Since coming to Jackson High and playing football, Dillon has been his lineman coach since freshman year, Dillon was always there if he needed something and to support him along the way. With nine siblings growing up Malaysia Wray spent a lot of her time reading; that is if she could find somewhere quiet. Wray was born in California and has moved back in forth from Michigan to California her whole life. Wray became a part of Jackson Highs class of 2014 her junior year. “I have had Malaysia in many of my classes; she is very driven and accomplishes whatever she puts her mind to. I had AP Government with her and she was always so good at debates. She’s very intelligent and is not afraid to voice her opinion.” Senior Kalei Hunt said. Wray participates in Quiz Bowl, Student Government, Senior Advisory, and National Honor Society. She won rookie of the year in Quiz Bowl. Quiz Bowl is her favorite out of the many activities and clubs she participates in. “I like Quiz Bowl because it helps me learn new seemingly unimportant things, like trivia. It also gives me a cleaner view of the world.” Wray said. As of now, Wray plans to major in political science since she’s so interested in politics. She loves watching the Rachel Maddow show. The Rachel Maddow show is a daily news and opinion show. It would be her dream to have her own outlet or podcast where she is able to speak about topics she’s passionate about. She feels strongly about Feminism in relation to politics and gun laws, those are just a few of her many. Wray’s viewpoints and brilliance has made an impact on many. “Malaysia doesn’t really talk much but when she does its logical. I can definitely see her being involved in the government when she gets older.” Senior Anna Georgopolous said. Wray’s favorite memory in high school is when Bassam Ikram brings donuts to senior advisory. She’s going to miss “Downtown Libby Brown” the most when she graduates. Her favorite class was Web Design with Mr. Turner. “In the year and a half that I’ve known Malaysia, she has impacted my life tremendously. I genuinely feel she makes me a better person. Her excellent judgment and decision making skills have come in handy more time than I’d like to admit. Although we have a mutual love of bad puns, we don’t have a lot in common. She’s sensible and responsible and selfless and let’s not forget brilliant! Basically, she’s an incredible person and I’m so lucky to be able to call her my best friend.” Senior Leah Kammel said.